I picked up this book worried about what I might be letting myself in for. I saw the film adaption a while back and didn't think it was all that great. I am pleased to say it was nothing like the book at all and I really enjoyed it. 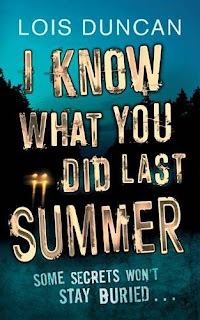 The book is similar to the film in that a group of 4 friends are involved in covering up a fatal accident they had been part of a year or so previously. The group have since started to receive mysterious letters and taunting amongst other things as the story progresses which they think are linked to the fact that they covered up the accident. The story itself is much more psychological thriller than slasher gory thriller and more me it made the story much more clever than the film could ever claim to be. There were parts of the story where you weren't quite sure what was going on. The final twist was really good and one I didn't spot coming until it almost happened. I liked how this book kept you guessing throughout! All in all an fab book which deserves better recognition than it currently has as it is a far superior version to the film that everyone seems to have read of! I love Lois Duncan! My favorite (which I think I'm going to re-read during the upcoming Readathon) is The Third Eye. Duncan also has a heart-breaking true crime book based on her daughter's murder called Who Killed My Daughter?. She's one of my favorite authors from back when I was a teenager, and I still enjoy her books. 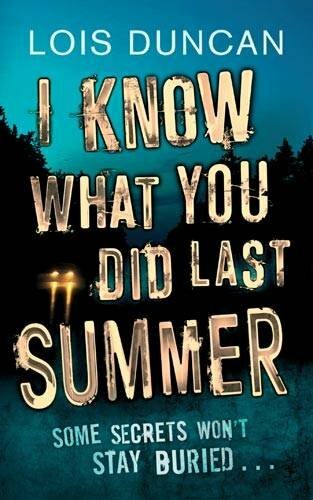 I remember being horrified, and not in a good way, when I saw the movie adaption of I Know What You Did Last Summer, the book is a million times better. Oh gosh, the movie was all the rage when I was 13 or 14 years old. I remember that we watched it at every birthday party... The meat hook was just horrible. I'm glad the book was better, while I enjoyed the movie for what it was, I don't think reading the same thing would be nice. Glad you liked the book! I read as a teen before tge film came out and thought it was very scary. The film wasn't so memorable to me. I may now pick it up again if it still has a good story after all these years - thanks!